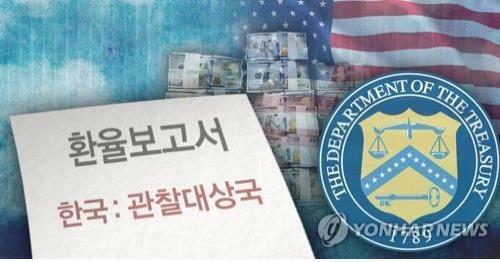 Home > News > U.S. > S. Korea avoids being labeled currency manipulator by U.S.
WASHINGTON, Oct. 17 (Yonhap) — South Korea on Wednesday avoided being labeled a currency manipulator by the United States but remained on a list of countries to monitor. The U.S. Department of the Treasury wrote in a semiannual report to Congress that it determined six major trading partners warranted attention to their currency practices. None met the criteria for a currency manipulator. The six countries are South Korea, China, Germany, India, Japan and Switzerland. To be labeled a currency manipulator, a trading partner must have a bilateral trade surplus with the U.S. of at least US$20 billion, a current account surplus of at least 3 percent of gross domestic product and “persistent, one-sided intervention” where net purchases of foreign currency are conducted repeatedly and total at least 2 percent of GDP over a year. South Korea’s goods trade surplus continued to narrow to $21 billion over the four-quarter reporting period ending in June, down more than $7 billion from its peak in 2015, the report said. The country’s current account surplus also contracted to 4.6 percent of GDP.